Lead alloy; 36mm/10.5gm, missing one leg...? Despite 1,700 years in the earth, this plow-broken image of a horse still remains elegant. The use of this horse effigy/talisman is problematic. 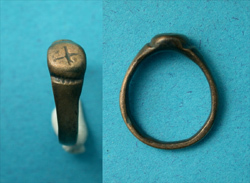 As lead is a very soft metal, we suspect that it was used as a 'good luck' talisman, rather than a Roman calvary harness piece. Such horse talismans were important to Roman cavalry soldiers who kept such in a small leather bag, either in their kit or worn as a necklace. Very rare object and rarely presented to discerning buyers.